Newlyn Copper Arts & Crafts pair of wall sconces, repousse hammered with a Luggar at full sail, each with removable drip pans. wide. 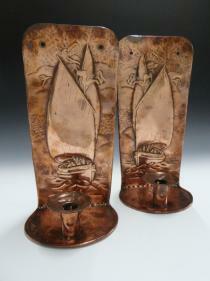 Literature: Daryl Bennett & Colin Pill, Newlyn Copper, Sansom & Company, page 24 for a single sconce with a Lugger design.